Coláiste Chiaráin, Croom, Co. Limerick is situated just twenty minutes from the heart of Limerick city.This coeducational post- primary college offers full-time education to boys and girls from first year to Leaving Certificate level, ranging in age from twelve to eighteen years. 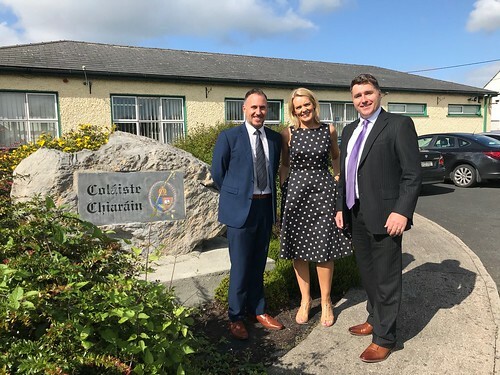 Currently one of the fastest growing post-primary schools in Ireland, the college has built up a national reputation in the delivery of a high quality and progressive educational programme, particularly with its emphasis on the sciences, languages, Information and Communication Technology and overall commitment to innovation, inall that it does. The present school building was built in 1987 and has become unsuitable for the level of expansion in student population currently taking place. As a result, the Department of Education and Science has agreed to provide a brand new school building and associated campus on a green-field site with a capacity for eight hundred students.This ambitious building programme is currently under way and when completed, promises to be one of the largest and best-equipped facilities in the city and county.